The first truly integrated golf simulation game for the PC. Designed to give both beginners and professional the best golfing experience - without the golf course! 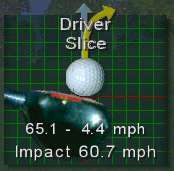 LaserGolf is the best PC golf game. Why? Because you play your shots with a club, not a computer mouse! 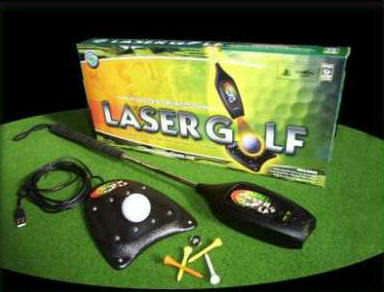 Every other game simulates a golf swing using the computer's mouse or control pad, but the breakthrough technology in LaserGolf gives you a realistic 'Light Club' to 'hit' the ball. The difference is like the steering wheel to a racing car game - the Light Club is as close as you can get to playing with your own golf club. 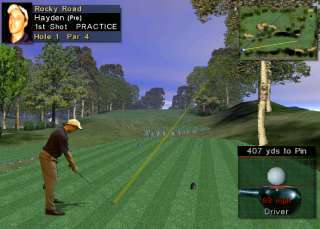 And it incorporates state-of-the-art computer graphics to give you the real feel for being on the fairway. Every detail of the course - greens, trees, even waterfalls and sprinklers - is rendered in 3D, so that you can fly with the ball in real time and see in every direction. Realistic animation's of real golfers behave just the way you would if you hit a perfect shot - or a complete turkey! A spot-on commentator, ambient sounds and an appreciative audience complete the experience. LaserGolf can be enjoyed by anyone, novice and expert golfers alike. Perfect for the whole family. Simulated digital photo of virtual club hitting the ball showing clubhead speed, follow through, clubface angle and relative impact position. Animated effects - waterfalls and running water. Customizable players with different levels of ability, from beginner to professional. Player-selectable Tee position and shirt color.